Type 9901 Rubber Water Suction Hose is a heavy duty rubber hose designed for pump suction and water transfer. 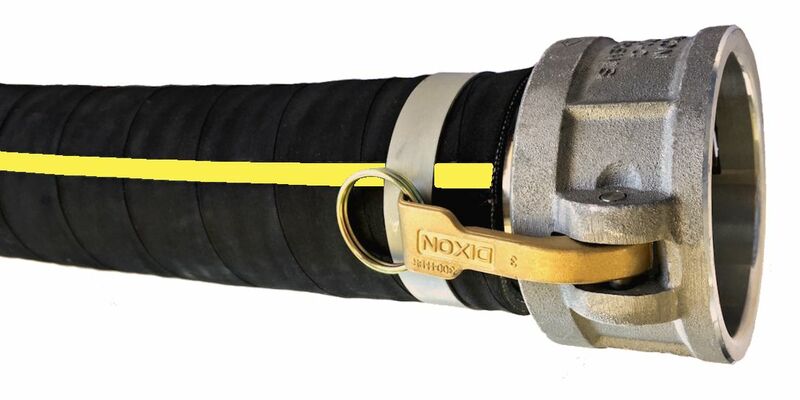 This hose offers maximum service life in moderate to severe applications with a heavy wall, wire and textile reinforcement, and a weather resistant EPDM rubber blend. The wire helix allows for full suction service at elevated temperatures, and provides a means for grounding the assembly. Rubber water suction hose is often relied upon as a heavy duty pump discharge or transfer hose, pipe connector, & for OEM equipment applications. A corrugated cover available in 6 inch ID and larger for improved flexibility. Available in a wide range of sizes, including 200 Ft continuous lengths in some sizes. Assemblies listed are 20 Feet. Other lengths available to 100 Ft max. MXF assemblies are aluminum with brass swivel, NPSH thread. Also available plated steel shank with brass or iron swivel. Cam coupling is aluminum standard (additional materials available), ball and socket is galvanized steel.